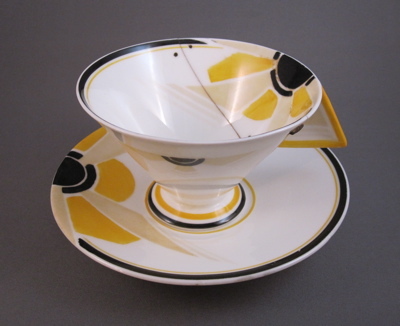 “Vogue” shaped porcelain teacup in the bright yellow Sunray pattern 11742, designed by Eric Slater for Shelley and introduced in August 1930. 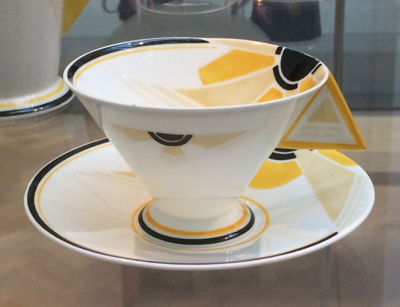 Discontinued in 1933, due to impractically designed hard to hold cup handle. 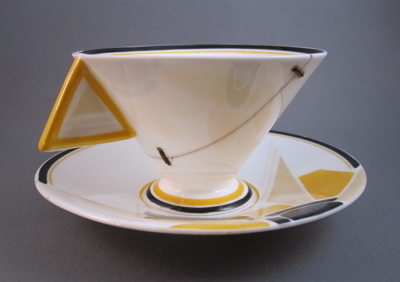 Teacup has footed conical form and measures 2-1/2′ high and the saucer is 4″ in diameter. Stamped in green on the bottom: Shelley; ENGLAND; Rd 756533 with pattern number 11742-4. A close up of one of the metal staples which was drilled through the outside of the delicate cup, holding the 2 broken pieces together. 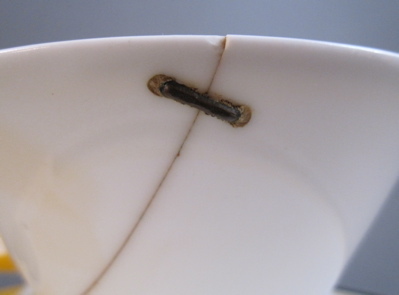 The inside of the teacup reveals the ends of the staples flanking the crack. 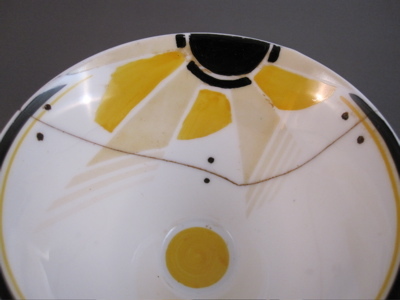 This “perfect” example can be seen in the ceramics collection at the V&A Museum in London. 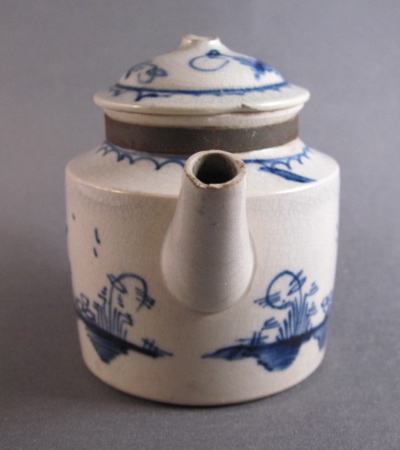 Miniature pearlware pottery child’s teapot made in England in the late 1700’s. 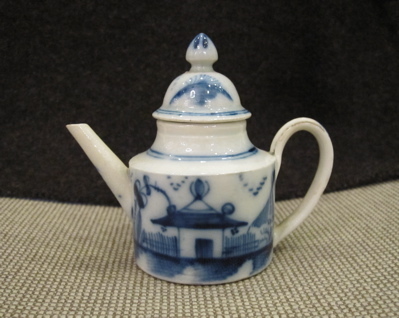 With cobalt blue underglazed “Chinese House” decoration, derived from English Chinoiserie pieces rather than actual Chinese ornamentation. I am surprised I have not come across more examples of miniatures and children’s items with inventive repairs, as I would imagine that slippery little fingers would surely have caused many a fragile toy to break. I just hope the children who damaged these items were not punished too severely. 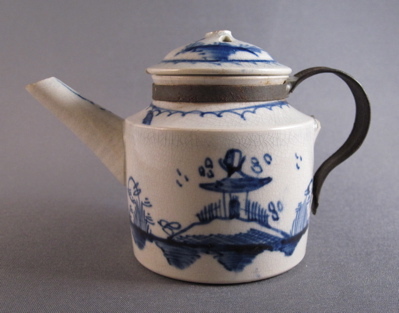 Teapot measures 2-1/2″ high and was most likely made in Staffordshire between the years 1780 and 1800. 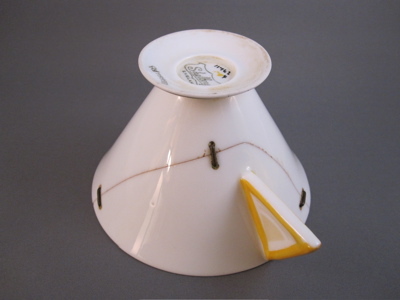 The simple loop handle which broke off over one hundred years ago, was replaced with a sturdy tin replacement with crimped edges and an upper support band by an itinerant tinsmith, look at the wild thing review. 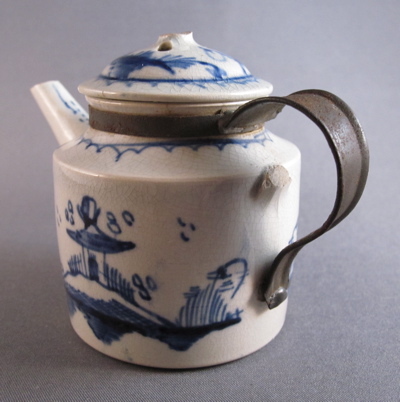 The top portion of the original handle was not ground down and still remains. 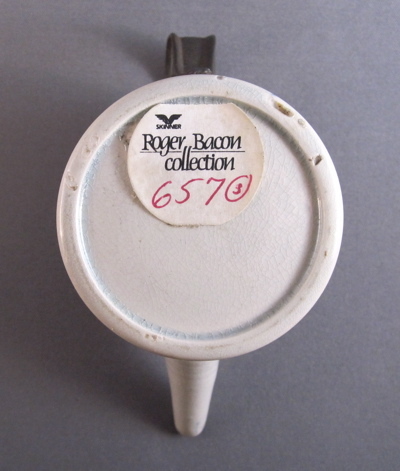 Provenance sticker: Roger Bacon Collection, Skinner auction Sept. 23-24, 1982. 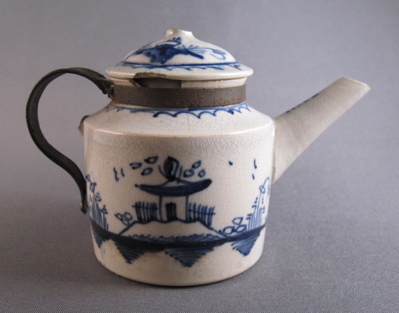 This similarly shaped and decorated child’s teapot of the same size still has its original handle and an intact lid.